Following these guidelines, we researched potential locations nearby. The first venue we visited was a dance studio. It was extremely convenient to get to from our house. There were beautiful hardwood floors and lots of open space. It was also very modern looking and a bit out of our price range. The next venue was on the opposite spectrum from the dance studio. It was an arts center that was decidedly un-modern in its architecture. 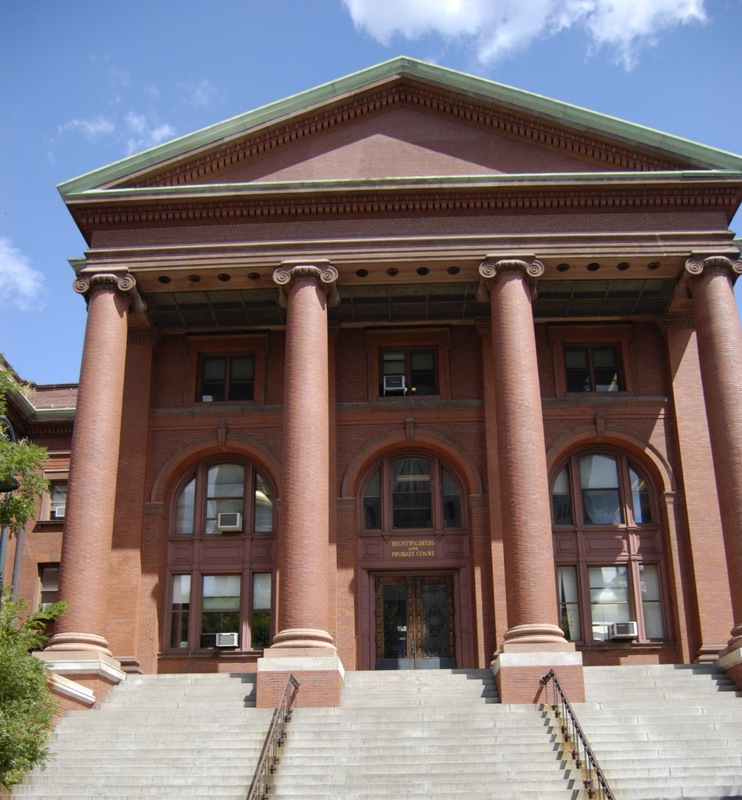 It had Greek columns on the outside and ornate designs on the walls inside. There was a circular courtyard nearby where the ceremony would happen. It was also slightly outside of our price range. Our verdict: too formal and stuffy. We then visited a venue that looked very promising, except for the fact that it was located in a rather ghetto neighborhood. Still, we decided to check it out. The venue had lots of space, hardwood floors, and gorgeous windows. It was definitely within our price range. But the outside view less than thrilled us. Lots of space, hardwood floors, and gorgeous windows. We also checked out the Boston Public Library, even though we were fairly certain we could not afford it. We ventured out to the library minutes before Hurricane Irene hit Boston. I got to take awesome photos of the Hancock tower right before the first rain drops. Hancock tower, minutes before Hurricane Irene hit. The library looked magnificent on the outside. There were many (ridiculously priced) options for rooms in which we could hold our reception. There was a beautiful outside courtyard for the ceremony. And of course, we love books, so the idea of getting married in a library intrigued us. Ultimately, though, our budget could not allow it. 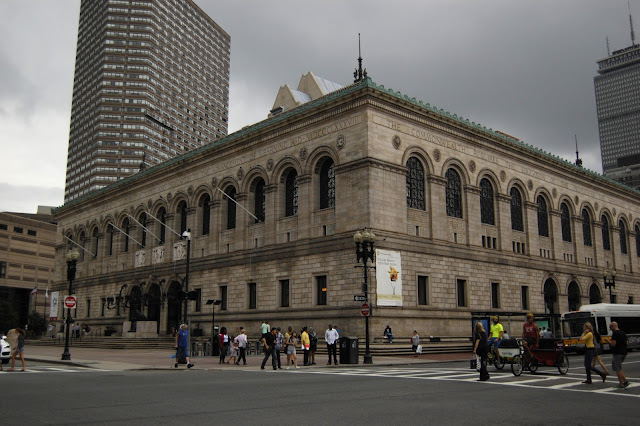 Boston Public Library, minutes before Hurricane Irene hit. 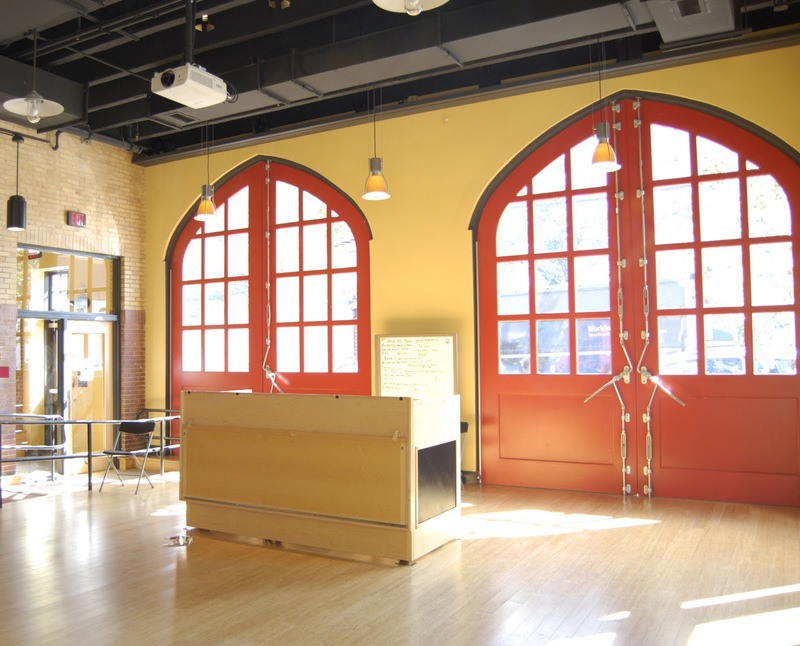 In our venue search, we came upon this gem - a converted firehouse that was a ten-minute walk away from a park that was located on the waterfront and had a beautiful view of Boston. The space inside was just large enough to fit our guests, not as cavernous as some of the other venues we had seen. It had hardwood floors and fire red doors. We could hold our ceremony in the nearby park and enjoy the Boston skyline. The venue was within our price range. We knew we found "the one". Outside of the converted firehouse. 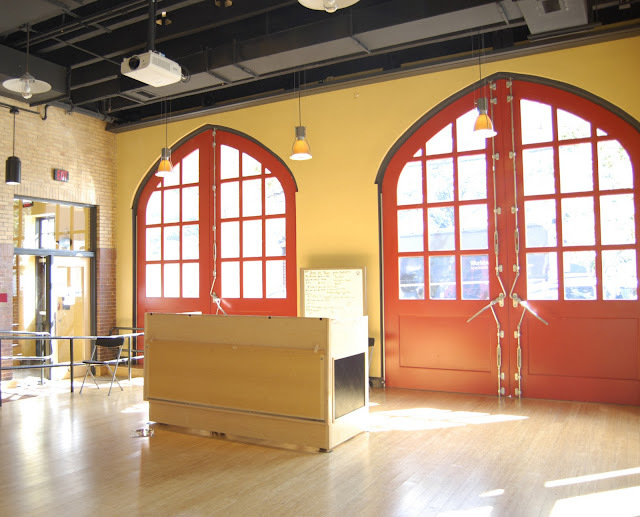 The fire red doors, from the inside. View of the Boston skyline from the nearby park. Oh I love it, red doors , and tons of light. Hi I was curious did you have to pay to have peirs park ? Yes, we had to pay to have our ceremony at Piers park, but it was a pretty reasonable amount of money.